Determining manganese content in drinking water with express test kit - simple and precise. Manganese is an undesirable heavy metal in ground water. First estimate the expected manganese content - high or low, in order to choose the right procedure. 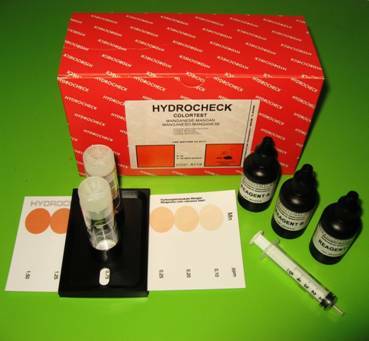 A high Mn content is analyzed in the range of 0.1-1.5 mg / l and a low 0.025 to 0.1 mg / l.
This analysis is typically used to evaluate unpurified water. Fill two test tubes with 5 ml of the test water using measurements on the syringe. In one of the tubes, add 4 drops of indicators in alphabetical order: A, B and C, mixing thoroughly after every addition. During mixing close the tube with the lid. Let the sample stand for 3 minutes. Another test is to compare the glasses, that the natural color of the water does not distort the color evaluation.To determine the concentration of manganese, compare the color of the test with the test picture. Place the test tubes in the holder with the test image A. Remove the cap on the test tube and slide the holder so, that the water filled test tube moves along the test colors and the colored sample is on a white background. Find the closest matching color from the test, compare the colors from the top, looking vertically through the tube. On the test picture the manganese content values are in mg/l Mn. This analysis is most often used to check the manganese residue content in filtered water. The procedure is exactly analogous to that described before, only that you need to fill tubes with 20 ml of test water and add 16 drops each indicator. After 3 minutes compare the colors analogously to the test image with low manganese content - B. Attention! The color evaluation should be done in a strong enough light, preferably daylight to obtain a correct results.